But let’s dive in anyways. The latest from Macquarie Research group, a leading provider of financial, advisory, investment and funds management services believes that a 25% correction in the Canadian National home price index would bring it back to trend. 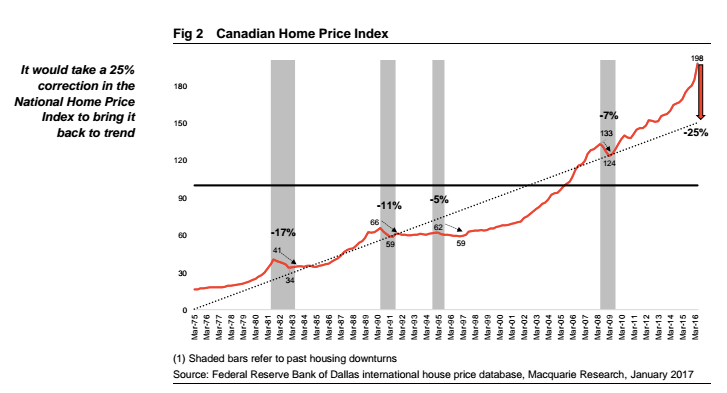 Canadian home prices need a 25% correction to fall back in trend line. Of course, in Vancouver that’s even higher. 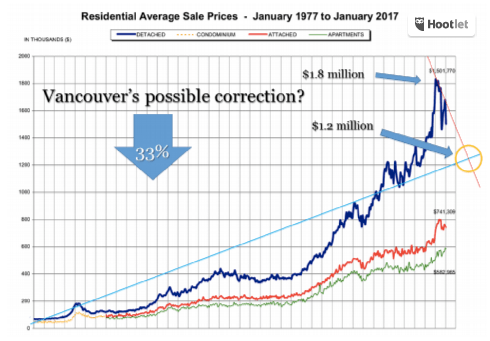 Famous Blog dog Garth Turner‘s doodling shows a 33% price correction would be required for Vancouver real estate just to fall back to it’s “normal” trend line. Vancouver needs a 33% price correction to fall back in line with it’s normal trend. There’s no question a price correction would come as welcoming news to many Vancouverites. According to Metro News, Doctors, lawyers, computer programmers and accountants can’t afford to buy a home in Vancouver. Previous articleWho’s Bubble is it Anyways?